rubric News about Benedict - from Ratzigirl above. It was the easiest to translate but quite interesting, so here goes. 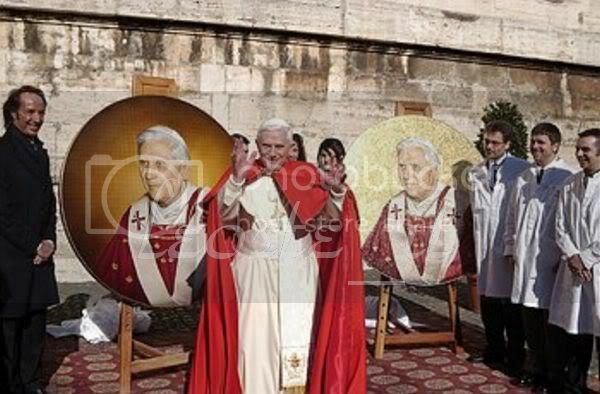 Benedict XVI’s portrait will soon join the line-up of Popes from St. Peter onward whose mosaic portraits adorn the nave of St. Paul’s- Outside-the-Walls. The portrait was to be presented to the Pope after the general audience today with the painter Ulisse Sartini, whose portrait was the basis for the mosaic executed by the Mosaic Studio at the Vatican, and the sponsors of the portrait, the Fondazione Pro Musica e Arte Sacra. The mosaic portrait will be on display at St. Paul’s-Outside-the-Walls on Saturday, November 26, before being attached to the nave next to the portrait of John Paul II. On Saturday, the church will also host a world-class musical event which concludes the 4th International Festival of Sacred Music and Art, sponsored by the Foundation mentioned above and by Daimler Chrysler Italia. The Vienna Philharmonic Orchestra, under Seiji Ozawa, will perform Anton Bruckner’s Symphony No. 9 and Te Deum. The concert will be preceded by the inauguration of St. Benedict’s Chapel, dedicated to Pope Benedict XVI, in the Basilica. The earlier musical events of the Festival each take place in one of the other major basilicas of Rome. On Friday night, 11/25, the ancient music ensemble La Venexiana will perform “The Vesper of the Blessed Virgin Mary” by Claudio Monteverdi at the Church of Santa Maria Maggiore. On Thursday, 11/24, the London Philharmonic Orchestra under Paolo Olmi will perform Rossini’s “Stabat Mater. The Festival’s declared aim is to revive masterpieces of sacred music in the places for which they were intended – not in concert halls, but in churches. But above all,its sponsors say, to restore sacred music and song in liturgical celebrations. Thus, the Festival opened today (11/23) with the Cappella Giulia directed by Pablo Colino singing Gregorian chant during the 5 p.m. Mass at St. Peter’s Basilica. With donations collected during the preceding Festivals, the sponsors have achieved some important restorations in recent years: St. Stephen’s Chapel in St. Paul’s-Outside-the-Walls; the 2 absidal organs at St. John Lateran; the dome of the Sixtus V Chapel at Santa Maria Maggiore; the German Chapel in the Marian Sanctuary of Loreto; and the library of the Pontifical Institute for Sacred Music in Rome. In which, however, the portraits are no match for the original! in which Pope Benedict asks the Franciscans who are in charge of the three major churches in Assissi to submit to the jurisdiction of the diocesan bishop. This has occasioned a lot of controversy and has been used by some liberals in Italy as a pretext to rail against the Pope. In fact, one Franciscan priest published a long tirade in the form of a prayer which is one of the most outrageous examples of arrogant sanctimony I have ever read. I won't translate it in full because it is venomous, but maybe I will pick out some things from it. More important, just now, is an interview with Vittorio Messori in which he gives his views on the Pope's decision and its repercussions. 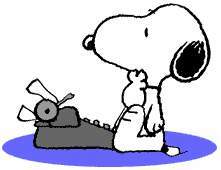 I'll be back as soon as I have translated it! Wow! I did not realize until I had to translate it word for word how strong are the opinions and judgments rendered by Messori in this interview about the Franciscans! Inclduing some eye-opening historic facts about St. Francis! “The Church has a long memory. This concerns the inter-religious meeting of 1986 about which Joseph Ratzinger had an account to settle with the friars of Assisi. And now things have come to a head.” Vittorio Messori, probably the most-read Italian Catholic author in the world (the only journalist to have co-authored a book with each of the last two Popes) reveals what is behind the recent pontifical action regarding the three Franciscan churches in Assisi and recounts how the future Pope Benedict XVI was indignant over some pagan sacrifices conducted at the altar of St. Clare’s Basilica, right over the Gothic crypt where the remains of the saint are kept. He was not a pacifist? Now, therefore, the Pope wishes to re-establish orthodoxy? The Pope wants to normalize things? The end to the “world capital of ecumenism”? I think the good friars just need to get over it. Aren't there some vows of obedience and humility that they take when they sign up? Is it going to kill them to have to work in a congenial way with the new archbishop who has been assigned to Assissi? He is supposed to be very well qualified for the post and even has a background in diplomacy, which he will obviously need. Papa is, after all, the pope. They aren't. It's time for a reality check for them and all those complaining loudly about this. It's not as if Papa condemned them to the rack. Benefan- I am actually shocked that the friars of Assisi should be so arrogant and be a "law unto themselves." I thought that was the exclusive province of the Jesuits! Anyway, now the Pope has laid down the law. Bravo for him, and good for the friars! But who ever said Papa Ratzinger was not a communicator? Benedict XVI has surprisingly conquered the media. Here is how and why: Benedict's power of communication lies above all in his extraordinary ability to make himself understood. And it is precisely around his message that the expectations of the whole Catholic world has focused on since April . It is easy to think of something, more difficult to do it. Benedict XVI has known how to make things happen. And he has succeeded ,in the wake of the cyclonic Karol Wojtyla, to give form and content to his own original communication style. And just like his predecessor, he has achieved in a few months the status of an international media presence, but in his own style. Of course, in the Catholic world, the identity of the Church does not always and only coincide with that of the Pontiff of Rome. But through the play of mirrors that communicative interaction imposes, the Pope’s image conditions that of the Church. Benedict’s media personality was defined from the days of the Sede Vacante, confirmed in the early days of his Papacy, and affirmed during World Youth Day in Cologne. On his second day there, when the TV cameras started showing his visit to the synagogue, it seemed as though the floodlights had lit up definitively around him. Even from among the so-called wits who had perceived him only as the “German shepherd”, from then on, he started to be known as everyone’s teacher. How much the grand themes of the Wojtyla Papacy had been thought about by Cardinal Ratzinger becomes clear as Benedict XVI ventures into those areas where the word of the Pope became church law and magisterium. And after the communicative and charismatic eruption of John Paul II, after an era in which the messages were extraordinarily overshadowed by images and gestures, the word once again reigns at the Vatican. Perhaps that is the first and also the most easily appreciable sign of discontinuity between the present Pope and his predecessor. Finally emerging from the shadows in which he dwelt during 24 years of collaboration with Papa Wojtyla, Benedict XVI immediately manifested that brand of efficient minimalism in communicating that we have come to expect and to follow in his discourses and homilies. It will be difficult from now on to consider the Pope as a sort of “guest star” in events that are presented as though they were in the same category as entertainment shows. If one pays attention to the way in which the CTV cameras show Benedict XVI, one might conclude that the Vatican has finally listened to the arguments of those who had objected, within the Church, to the lamentable practice of lumping in the same category as general television fare even the most ecclesiastic events involving the Pope. Ratzinger the theologian has always taught that it is possible for man to speak with God because God himself is the word – discourse, listening, response. That all this – Benedict’s unique communicative style - is evident' even as his Vicar (Cardinal Ruini) has recourse to the mass media, is totally consistent with the intellectual weight of a Pope who also knows how to teach. Thanks Teresa for two intersting articles. Particulary the first one explaining the question of the Franciscan friars. I hope that they will be obedient in the end. St Francis has never been a revolutionary. I had glanced at the news about the Asissi friars on Spirit Daily, but not until I read Teresa's careful translation of the Messori interview did I realise that in 1986 animals had been sacrificed on one of the altars there. A case truly of the smoke of Satan entering the sanctuary. Up to now I rather thought the World Day of Prayer had been about being nice to the Archbishop of Canterbury and the Dalai Lama, not consorting with witchdoctors. I thought we still had missionaries in Africa - are they wasting their time? I'm glad Pope Benedict is making it clear what is expected of religious houses who maintain holy places. St Francis and Padre Pio, pray for us! yes,Papa's portrait on the coins look old,i mean he looks old in 'em..see,you can compare cuz he satnding next to those,and he looks sooo young! Here is the link to Catholic News Service article on 7 months of the Benedictine Papacy - quite positive! Teresa, your link didn't work. I think this one will. However, since both urls are identical, I don't know why one works and the other doesnt. Thank you both for the article and Teresa for the previous ones. It is funny to read how the "Roman rumor mill" put out reports of an impending shake-up in the Roman Curia and that journalists were aggravated when none occurred. Nice way in rhyme to wish someone kisses!!! loriRMFC, welcome to the club. You are right about the journalists. They have been predicting since Papa was elected that he was going to literally have heads rolling in the curia and elsewhere. Instead, it seems he is going to replace people as they resign or age out of their jobs. It gives the journalists nothing to write about. Unfortunately, that encourages them to make things up. Benefan- The December 3 concert is the one that an ex-Cranberry will be at. Ratzigirl has an article with more details translated below. It seems to be a pop concert more than anything else – and they are selling tickets to the public to raise funds - so I don’ t know if the Pope will attend. But I’ll post the story here until we decide on an efficient classification of topics. I’m showing my age but I am mosrt excited about the participation of Paul Anka and Miriam Makeba, who according to this item will close her career with this performance. “Christmas at the Vatican- Concert for the Oriental Missions” will take place on Saturday, Cecember 3, at 6:00 p.m. in the Vatican’s Paul VI Hall. The concert is organized by Time Promotions in cooperation with Society of Jesus. The object is to make the public more aware of the Church’s missionary vocation and to raise funds to support Catholic missions in East Asia. This theme is particularly dear to Pope Benedict XVI. The concert officially opens the “Xavier Year” of 2006, proclaimed to honor the patron saint of missions, St. Francis Xavier, on the 500th anniversary of his death. The program will therefore feature previously unheard numbers from a musical about the life of the saint, “Xavier- Dreaming of China” (music by Enrico Blatti, lyrics by Ennio Speranza). The actor Giancarlo Giannini will narrate episodes from Xavier’s life as well as an appreciation of that life. Musical artists from all over the world will perform, underscoring the universality of the Church, in an encounter of diverse nations, cultures, religions, life experiences, ideals and musical genres. The line-up so far includes two gospel groups from the United States – the Virginia State Gospel Chorale and the Strathclyde Police Band. From Canada, Paul Anka. From Ireland, Dolores O’Riordan from the break-up of the Cranberries. From Brazil, Daniela Mercury. And from Sotuh Africa, Miram Makeba, who with this concert, officially marks the last public performance in a long and storied career. Milk, Chocolate and Honey - the multinational, multi-ethnic children’s choir of the Rome-based Food and Agricultural Organization - will perform. And from Italy, some of their biggest pop singing stars: Claudio Baglioni, Riccardo Cocciante, Gigi D’Alessio, the Negramaro, Alex Britti, Mango, as well as young jazz talents Nicky Nicolai, Stefano Di Battista Quartet, Dolcenera and Giada Nobile. A young tenor, Gian Luca Terranova, who recently interpreted a musical on Caruso, will represent the world of opera. The performers will be singing traditional Christmas songs as well as their greatest hits. Some will be singing duets of original songs that have not been recorded before. All musical arrangements will be done by Maestro Renato Serio who will conduct the Fondazione Orchestra Sinfonica of Palermo. The concert will be televised in Italy on December 24 with a radio simulcast. The Times is actually not negative about Papa for a change. The article does, however, bring up his shoes and sunglasses. Lord, have mercy! When will they move on? This article provides more information about the new archbishop that the Franciscans will have to report to and who the archbishop will report to. I especially like the last two paragraphs summarizing what some are calling a "brilliant" move by Papa. Not bad - considering the source! Thanks for the lead, Benefan. The "worst" the Times article could find to say was that B16 has "taken to stylish sunglasses and bright red shoes made by Prada." (As though the choice of color for the shoes were his!) Also, I object to the description of him as "a somewhat dowdy, professorish man" - when was Ratzi ever ever DOWDY???? Also, they didn't factor into the article the Pope's recent Motu Proprio on the Franciscans, quite a significant decisive step! P.S. Great "perspective" story on the Assissi changeover! All the more reason the Times article should have incorporated that development in their story. The Motu Proprio came down a few days ago. They had time to put it in. thanks for all the articles..i think people are just looking for things to pick about Papa's papacy so far..but hes doing sooo good thanks to God!